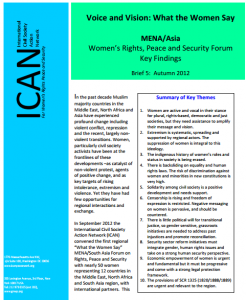 In September 2012 the International Civil Society Action Network (ICAN) convened the first regional “What the Women Say” MENA/South Asia Forum on Rights, Peace and Security with nearly 50 women representing 12 countries in the Middle East, North Africa and South Asia region, with international partners. This group of peace and women’s rights experts, practitioners, activists and scholars met over a four-day period to draw on the framework provided by UN Security Council Resolution 1325 on women, peace and security to compare and contrast the fast-paced changes in the region. Their discussions included country situations analyses with attention to the gender dimensions of root causes and evolving political, economic, security, religious and socio-cultural trends; the threats and opportunities facing women’s movements; and the gendered dimensions of key transitional issues notably, legal and constitutional processes, transitional justice, security sector and economic reform.